Indoor localization systems have to face very challenging conditions, e.g. dense multipath scenarios resulting from propagation phenomena like reflections and scattering. 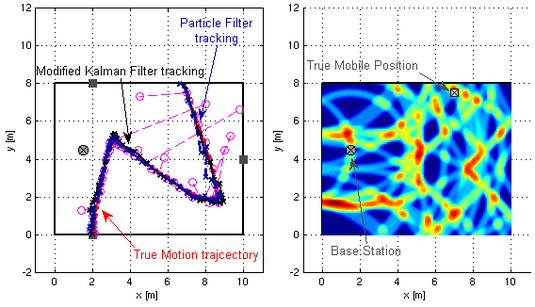 Recently, our group has proposed a series of robust and accurate tracking algorithms for an ultra-wideband radio-based localization concept that is able to effectively make use of reflected signal components. We reach accuracies on centimeter level at a high level of robustness. For further information, please see our paper at the IPIN 2010!